43 Inverness Street is very pleased to announce HaYoung Kim’s second solo presentation. Kim’s work is cheerfully colourful and painted with fluency and although the work is thinly painted, a depth is created through duration and emergence. Imagery which is partially buried or semi-obscured in Kim’s work requires a second lingering examination. 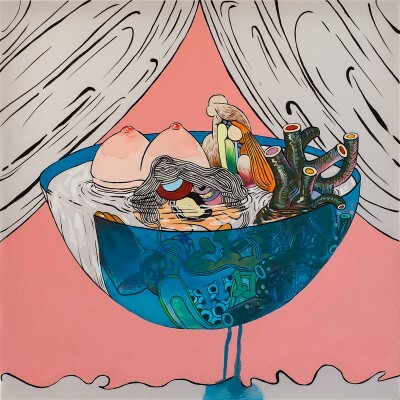 For example, in the painting Modern Soup, 2014, the bombastic inclusion of breasts serves as an indication of other stranger, less identifiable body parts, which cascade in a continuum of painterly body-food confusion. On the ground floor at 43 Inverness Street, the artist has hung six 50x50cm acrylic paintings on polyester. These works evince the strangely open world of the animation cell. 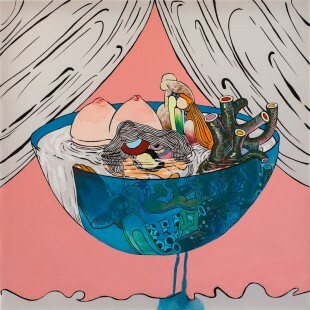 Powered by brushed black outlines and bold flat colour, each of the paintings is a study of some soft material: food, furnishings, body parts, and other murky portrayals of mushiness. 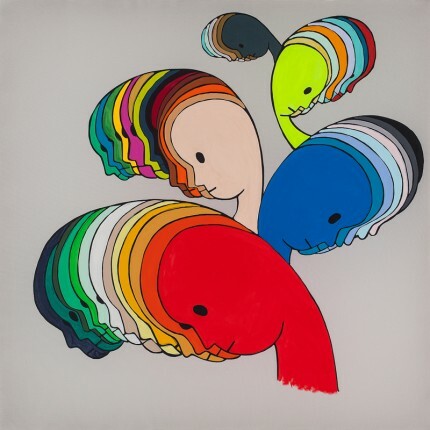 These new paintings such as Boom Shakalaka, Becoming Head, and Bon Appetit! are a study of the cast-offs of a tried-on identity, the paraphernalia of our modern world. Opacity and transparency reverse their usual roles in a painting which bisects the gallery on the first floor. 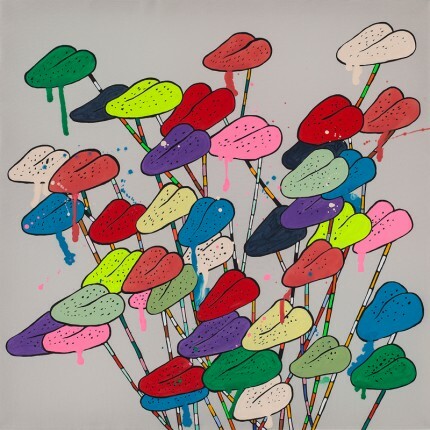 Do Humans Dream of Growing Electric Plants?, 2014, is a 3 meter wide painting on drawing acetate (a clear sheet of flexible plastic), in which the see-through, glossy underside reveals the underpainting, and the cloudy painted surface shows the last compositional decisions made by the artist. Suspended on lines hung from the ceiling, the work is a rollicking colourful cornucopia of manga inspired movement where the action is generated through formal delight rather than the population of characterless characters in the scene. In the basement, Chikichiki Chakachaka Choco Choco Cho, an intimate presentation of a video animated from the artist’s sketchbook, provides a glimpse into the formation of the paintings. Polymorphic figures dissolving into spaghetti-lines and tubes and back again to a soundtrack of minimally-produced vocalisations made by the artist. The work is not only beautiful because of its fragile fluidity, but because it also has the seemingly improbable directness which permeates all the work on show at 43 Inverness Street. Born in 1983, HaYoung Kim lives and works in London, She attended the Royal Academy and has been awarded the Jerwood Prize (2010), the Soloman J Soloman Prize (2010), the Dunover de Segonzac Award (2010). In 2011 she participated in the Vytlacil AIR program in New York. Selected solo exhibitions include Virtualium Window Gallery, Gallery Hyundai in Seoul (2013), Eat All You Can, Hoxton Art Gallery, London, (2012) and HaYoung Kim, 43 inverness-Street Gallery in London (2011). 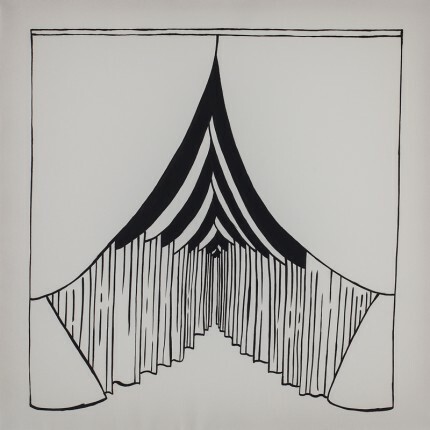 Selected group exhibitions include Ironic Mythologies, Amelia Johnson Contemporary in Hong Kong (2012) and Penumbra, the Bermondsey Project Space in London (2012).